Forgacs maintained their welding standards whilst simultaneously removing the risk of fire and serious health issues to their workers. Because they used less product the change came at an overall cost saving to the business. By using Purasolve Surface Prep instead of Acetone, Forgacs avoided the risk of Acetone fire and explosion which is sadly too common in such workplaces around the world. For their workers the risk of permanent liver damage from toxic fumes is no longer a worry. Fires, explosions and serious health issues are all bad for business. Forgacs’ switch from Acetone to Purasolve Surface Prep was a prudent risk management measure that removed some potentially disastrous and costly outcomes for the business. What’s more it did this by saving on overall costs. Because Purasolve Surface Prep is safer and doesn’t evaporate quickly workers at Forgacs were able to improve their surface prep practices getting cleaner welding surfaces with greater efficiency. Because there is no risk of explosive vapours accumulating Purasolve Surface Prep enables surfaces to be cleaned and welded in confined spaces with less requirement for ventilation. Cleaning surfaces with Acetone prior to welding is common. For critical jobs such as those in shipbuilding it is essential to remove all contaminants from the metal surface prior to welding. Failing to do so can mean foreign matter is incorporated within the weld itself resulting in sub-standard strength. A dirty surface can also affect the performance of the welding equipment itself. 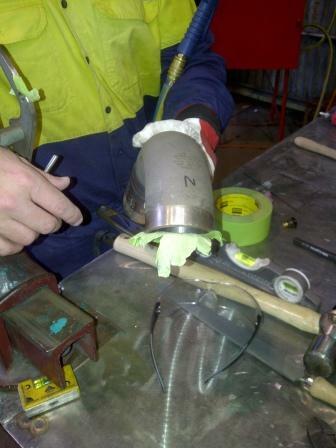 Achieving a ‘clean weld’ is of particular importance when dealing with specific codes for QA. Whilst Acetone achieves a good cleaning result it does not evaporate entirely from the welding surface and when high temperatures are subsequently applied a toxic vapour is produced. This vapour can cause irreparable liver damage and other health effects if inhaled. Acetone also presents a fire risk in this type of environment. In addition to the health risks Acetone has a low flashpoint making it a considerable fire risk – particularly around welding operations. The high vapour pressure of acetone also means it evaporates quickly often requiring several applications before a surface. 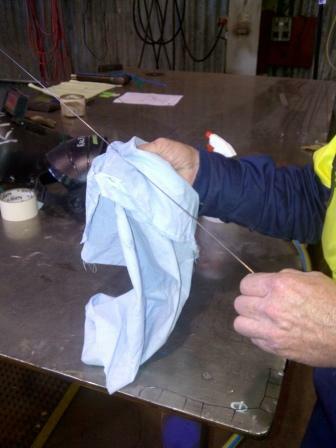 Clean welding surfaces without fire risk or toxic Acetone vapour. Whilst Acetone is listed as GRAS (Generally Recognised as Safe) thermal decomposition or burning of Acetone residue can release certain carbon oxides and other hazardous gases. It is these by products of thermal decomposition that present the primary health risk to workers. Some of these gasses can cause irreparable liver damage if inhaled. Potential symptoms: Irritating to eyes, skin dryness and cracking, drowsiness, dizziness, vertigo, nausea or vomiting, discomfort of the respiratory system. Health Effects: Irritation-Eyes, Nose, Throat, Skin, Discomfort of the respiratory system. Affected organs: kidneys, liver, upper respiratory tract, skin, central nervous system (CNS), eye, lens or cornea. Acetone has an extremely low flashpoint (-17 degrees C) and its vapour is heavier than air meaning it settles and concentrates in low areas. There have been numerous cases of fires and explosions caused by the use of acetone near ignition sources such as welders. A tablespoon of Acetone inside a 44 Gal drum is enough to produce a potentially explosive atmosphere. The Purasolve range offers low hazard alternatives to common industrial solvents which replace dangerous and toxic products such as MEK, Acetone, Gun Wash, Trichloroethane as well as products containing benzene and its derivatives. Purasolve Surface Prep is non explosive, has less odour than Acetone and evaporates completely leaving no residue. For a powerful solvent Purasolve Surface Prep has an extremely low vapour pressure meaning that less product is lost through evaporation. This means workers save time and overall less product is used.